Based in Gloucestershire, UK, The Flyscreen Company has established itself as a leading supplier of fly screens, insect mesh, soffit mesh and other insect preclusion products within the UK and international market. Recommended by Environmental Health Officers as an approved method of disease prevention, our products are designed to provide effective, unobtrusive and hygienic protection against flying insects. The Flyscreen Company manufacture and supply a range of made-to-measure flyscreens for windows and doors, DIY Kits, roller blinds, blackout blinds, insect mesh, soffit and cladding mesh, chain screens, mosquito nets and electric fly killers. We deliver contracts to order across all our products, and will design, manufacture and supply screens to your required specifications and quantities.Our East African Agency is involved in the provision of a range of insect repellents and insect preclusion materials to Aid and Relief agencies and other non government organisations. Domestic - Providing a range of insect preclusion products for the home user. Commercial - Health and Hygiene compliance for commercial kitchens, schools, hospitals and factories. As well as our Made-To-Measure products, The Flyscreen Company can supply Soffit Mesh in various sizes from 50mm wide to 300mm wide and 45 to 50 metres long, in black or grey which can be used to prevent flying insects from entering your home or business. You can also purchase Insect Mesh by the metre at widths of 1200mm or 1800mm wide. There are various types of Mesh, Fibreglass PVC coated, Polyester, Aluminium and Stainless Steel. Visit the Mesh Shop for the full range of products. Specialists in servicing military contracts in the provision of insect and blackout screening as far a field as Kosovo, Afghanistan, and Central America. The Commercial range of Fly Screens is suitable for all commercial and industrial kitchens including care, health and educational establishments; as well as restaurant, hotels, hospitality and retail businesses, factories and manufacturing environments. Providing to care homes and other public sector services.Domestic and trade contracts worldwide. Making an enquiry - including requesting a price - is very straightforward. Look through the web site and use the product links, to the left or above, to decide which products you are interested in. There are downloadable PDF files giving Full Product Details for each of our products.When you have decided which product you are interested in, simply complete the details requested and click on the Add to Enquiry button. Add further products to your enquiry as you need. You can view your enquiry at any time. When you are ready to submit your enquiry click on the Finish Enquiry button.On receipt of your enquiry we will calculate the cost and contact you with details of the price, production time and how to proceed. 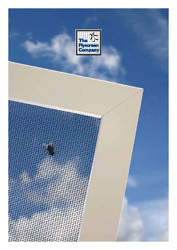 The Flyscreen Company supplies a range of pest control and exclusion products, that provide effective protection against flying insects, to satisfy all your hygiene and environmental health and safety needs.We are specialist manufacturers of bespoke fly screens for windows and doors and supply insect preclusion products to homes and businesses in the UK and around the world.Products range from those suitable for use in homes and small businesses, to retail and commercial premises and to large industrial concerns.We manufacture and supply a range of made-to-measure flyscreens for windows and doors, DIY Kits, roller blinds, insect mesh on a roll, soffit mesh for ventilation and cladding, chain screens, mosquito nets and electric fly killers.The Flyscreen Company will deliver contracts to order across all our products, and will design, manufacture and supply screens to your required specifications and quantities.